"Culture is so much alive and vibrant. What makes you Aboriginal is the culture and the kinship and the stories you can recite and sing: this is the starting point and great theme and end-point of all my art. 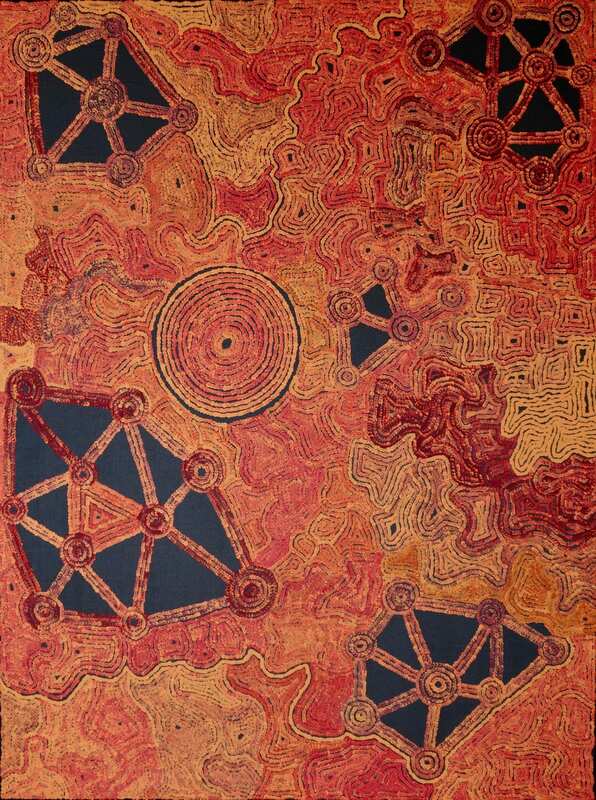 In this particular painting, the whitish lines that move in a meander against the more coloured backgrounds demonstrate our capacity to travel freely through our world: how we can go from a starting point in Papunya as far as the Pitjantjatjara or Ngannyatjara lands - and these are the travelling lines that show how far we can roam. The wavy lines in the painting also represent the sand-dunes of our country, they take their inspiration from the soft shapes and contours we see in nature. But here is an important point: yes, these lines come from nature, but equally from our stories about the world of nature. It is a twin inspiration; the land. and our appreciation of the land. You will see that there are elements in common in many paintings, and in a great deal of traditional desert painting by different artists. What is beautiful for us is our art and most valuable, is precisely the repetition and conservation of all that we've been taught about our culture: all the stories, all the designs. Originality is not such a strong value: proper preservation of the unvarying tradition is a much higher value, although of course it leaves room for individual expression."